HUD-DX1 allows its users to enjoy a high-level Audiophile sound world by supporting replay of a high-quality DSD sound source (2.8/5.6㎒) in native mode using USB bus power alone, DXD sound source (352.8/384㎑), another high-quality sound format, as well as optical input (24bit 192㎑) and MQS (Mastering Quality Sound, 96~192㎑), Hi-Fi sound source, without any loss rendered in studio recording specifications. 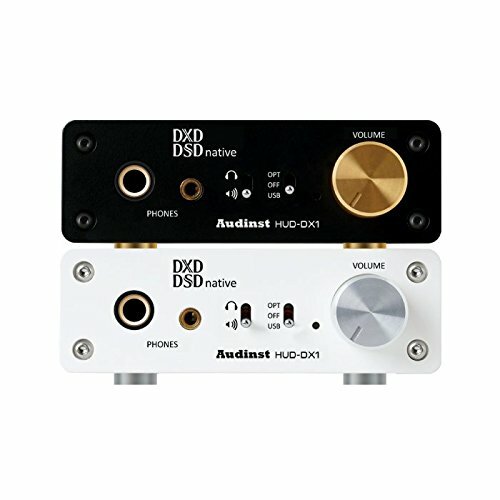 HUD-DX1 also allows its users to enjoy sounds with even higher output and high-quality sound when connecting additionally to the adaptor provided. Luxurious Black Color The Black color shows luxurious and stable shape with the assembly of a gold volume knob and spike, while white color shows a neat and sophisticated shape with the assembly of silver knob and spike. Additionally supports playback of 32-bit/384㎑ DXD sound source and optical input Since the HUD-DX1 is designed to support not only the playback of DXD sounds in 24-bit/352.8㎑ format, but also to support optical input functions that are not supported by products from other companies. It allows users to convert a maximum 24-bit/192㎑ PCM digital signal into a high quality analog sound output and play it back. Playback of Native DSD Equipped with the newest USB 2.0 high speed audio controller from XMOS and ES9018K2M, a high performance DAC from ESS, it supports playback of Native DSD (DSD64 / DSD128) as it plays back sounds in excellent definition and Hi-Fi audio quality. Top Class OPAMP and High Performance Headphone Amp Adopting the MUSES series OPAMP, a top class one specifically designed for Hi-Fi audio products by NJRC, HUD-DX1 uses MUSE8920 for its I/V converter and filter circuits for excellent matching in sound quality and optimum constitution that realizes high performance and high fidelity audio with a top class sound balance and very low distortion, as well as ultra-low noise. HUD-DX1 is designed to support not only the playback of DXD sounds in 24-bit/352.8㎑ format, but also to support optical input functions that are not supported by products from other companies. If you have any questions about this product by AUDINST, contact us by completing and submitting the form below. If you are looking for a specif part number, please include it with your message.